In 1999, the National Association of Social Workers (NASW) Delegate Assembly proclaimed that “environmental exploitation violates the principle of social justice and is a direct violation of the NASW Code of Ethics.” Consequently, a new social work policy statement was issued on the environment. In 2010, the Council on Social Work Education (CSWE) declared that sustainability is the social justice issue of the new century, with the theme of the 56th CSWE annual program meeting being “Promoting Sustainability in Social Work.” The global issue of sustainability has finally garnered the attention of social work, a profession preeminent in the field of social justice. The social work profession, although governed by the “person-in-environment” principle, has long neglected the environment-in-person. This environment includes not only social and economic contexts but also the natural world. The first mention of the natural environment’s importance to social work practice can be found in the 1995 Social Work article by Berger called “Habitat Destruction Syndrome.” The following year, Park discussed the role of social workers in the environmental movement in the Social Work article “The Person Is Ecological: Environmentalism of Social Work.” After that, the literature was somewhat silent until 2002 when an increase of both texts and articles on the subject of social work and environmentalism began to emerge. Although social work previously considered involvement with improving the natural world to be for environmentalists, this exclusion is no longer acceptable. If social workers know that context is a prime determinant for quality of life, the deteriorating natural world must become part of social workers’ concern. There are three types of sustainability in social work: social, economic, and environmental. Social work has focused on social, touched on economic, and largely ignored environmental. Social workers are familiar with social sustainability, which recognizes that individual health and well-being, nutrition, shelter, education, and cultural needs must be met (Brennan, 2009). Environmental sustainability requires that “natural capital remain intact,” meaning natural resources should not be used in excess of their rate of renewal. In addition, nonrenewable resources should be guarded and used minimally. It is here where the field of social work has been largely inactive. How can social work address these three elements of sustainability in equal portion? 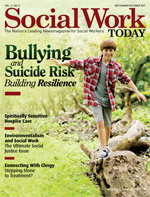 Mary (2008) proposed expanding social work values to include transpersonal elements and demands that social work education, in academic coursework, fieldwork, and continuing education, take a radical look at the ways in which social workers can help improve their clients’ world, figuratively and literally. Her collaborative model includes the three elements of sustainability but also proposes a new way of looking at systems to include the interconnectedness espoused in transpersonal theory plus an emphasis on the spiritual dimension and nonviolent politics. Mary’s model encourages workers to be stewards or caretakers of the Earth. Cowley (1994) has also been a proponent of social work adapting a transpersonal approach as opposed to the strictly reactive modernist approaches. Postmodern approaches, including that of transpersonal theory, suggest that exposing social work students to a transpersonal perspective that includes the spiritual dimension could have far-reaching implications for the relevancy of social work education to current human events. The interconnectedness that both Cowley and Mary endorse comes at a time when political and global environments demand it. Students are introduced to the person-in-environment paradigm early in social work study in courses on human behavior and the social environment, which are strongly recommended by the CSWE. Yet little can be found about the natural or physical environment in these courses. An informal discussion among several graduate-level human behavior and social environment and policy faculty revealed that environmentalism may be mentioned, but is rarely explored in classes. Individual student projects may address it, but otherwise sustainability is not emphasized. A logical consequence of the exploitation of natural resources is the exploitation of people. Both directly and indirectly, populations have suffered as a result of environmental damage. The lost homes and livelihood resulting on the Gulf Coast due to Hurricane Katrina in 2005 and the BP oil spill in 2010 show this all too clearly. The University of Southern Mississippi School of Social Work established the Katrina Research Center whose mission reads: “The Katrina Research Center serves as an interdisciplinary center and a public clearinghouse to facilitate the gathering of historical and current information and knowledge. Such knowledge includes the natural, physical, social, political, economic, and spiritual aspects of recovery from Hurricane Katrina and other disasters.” This school of social work clearly recognizes the natural world as part of its study of person-in-environment. • Deforestation has deprived indigenous people of their homeland. • The toxic pollution of Love Canal in upstate New York resulted in unprecedented disease counts in members of the community. • Environmental racism is rampant, demonstrated by industries dumping waste in poor neighborhoods. • Overfishing has depleted both the oceans and the livelihood of people dependent on the industry. • Environmental illnesses have dramatically increased in recent years, including higher rates of asthma in urban children. Coates says, “When the Earth has been senselessly exploited and polluted, social injustice has been a result” (p. 24). Increasingly, social work has come to explore, even if it doesn’t embrace, environmental issues as part of the profession’s mandate. Recognition of the importance of the natural world in healing can be found in adventure-based programs such as the Eden Alternative in long-term care, animal-assisted therapies, and Fresh Air Kids. These programs recognize the importance of the natural world. Programs emphasizing the conservation of natural resources are not often found in social work organizations or general social work practice, but hopefully this will change. As mentioned, CSWE made sustainability the focus of their 2010 conference. In Pennsylvania, the NASW announced that the opening ceremony for the 2011 annual conference will be “Marcellus Shale Natural Gas Extraction in Pennsylvania: Effects on Communities, Families, and Natural Resources,” which will discuss the social, economic, and environmental impact of natural gas extraction. Community practice roles for social workers will be discussed, with an emphasis on partnerships that promote community education, planning, and advocacy. In 2006, the March/April issue of Social Work Today reported on graduates of Manchester College in North Manchester, IN, who wore green ribbons signifying that they had taken a graduation pledge: “I pledge to explore and take into account the social and environmental consequences of any job I consider and will try to improve these aspects of any organization for which I work.” This symbolic step denotes a level of awareness not generally asserted by graduates. One example where social work and environmentalism intersect and are recognized is environmental racism. Environmental racism refers to the intentional or unintentional targeting of minority communities or the exclusion of minority groups from public and private boards, commissions, and regulatory bodies. It is the racial discrimination in the enactment or enforcement of any policy, practice, or regulation that negatively affects the environment of low-income and/or racially homogeneous communities at a rate disparate from affluent communities. So where can social work go from here? Some direction can already be found in the profession’s literature. Australian and Canadian social work authors have recognized the connection between social work and environmentalism (Bay, 2010; Borrell, 2010; McKinnon, 2008; Zapf, 2009). A new and dramatically different definition of ecological social work has been outlined (Ungar, 2002). An expansion of the social work model has been proposed that requires a new perspective focused on society and its problems and the values of social work. The University of Denver Graduate School of Social Work’s use of Web technology, including Facebook, to raise awareness and identify opportunities for social work to incorporate environmental concerns in practice is decidedly unusual. The goal of this project is to expand the social work ecological model. The working definition and mission of this project should be considered as a potential model for the profession. Additionally, the ConservationSocialWork.org website notes, “Conservation Social Work (CSW) expands the social work ecological model that focuses on persons-in-context to include the consideration of natural physical environments, interrelationships with nonhuman animals, thoughtful stewardship of natural resources, and advocacy and skills for environmental health and resilience. The Life Model of social work practice recognizes three categories of problems in living: life transitions or crises, dysfunctional interpersonal relationships, and environmental pressures. Environmental pressures are described as the lack of resources or social provisions from social and physical environments. In addition to the lack of supportive social or organization networks, the Life Model speaks to unsupportive physical settings. It is not difficult to stretch this definition to include the dwindling natural resources that disproportionately affect those in deteriorated neighborhoods or unsustainable living conditions. Social work, as the profession that prides itself on social justice as its foundational principle, should include environmentalism in its scope of practice. Environmental justice demands that social work education look at the ways in which social workers can help improve the world of their clients, both figuratively and literally. Rather than a mention of environmentalism as a social justice concern, courses and fieldwork should provide the opportunity for students to explore the nexus of environmentalism and social work. Social workers must think differently about social justice, with more community-focused action regarding environmental policy. Social workers should consider making the Life Model their overarching approach to practice in addition to specific intervention models or techniques used. Social work’s reliance on “systems” thinking implies that a change in one system has a ripple effect on another. Life Model asserts a “rebound” effect—that what we do has a ripple effect which in turn rebounds to affect us. Using Life Model as the meta-theory to our work will impel us to more consistently work to improve the natural world of our clients. Social workers may support environmental justice through personal efforts at sustainability and financial support of environmental causes, but more collective advocacy is needed. — Claudia J. Dewane, DEd, LCSW, BCD, is an associate professor in the College of Health Professions and Social Work at Temple University in Harrisburg, PA.
Bay, U. (2010). Social work and the environment: Understanding people and place. Australian Social Work, 63(3), 366-367. Besthorn, F. (2002). Radical environmentalism and the ecological self. Journal of Progressive Human Services, 13(1), 53-72. Besthorn, F. H., & Saleebey, D. (2003). Nature, genetics, and the biophilia connection: Exploring linkages with social work values and practice. Advances in Social Work, 4(1), 1-18. Borrell, J., Lane, S., & Fraser, S. (2010). Integrating environmental issues into social work practice: Lessons learned from domestic energy auditing. Australian Social Work, 63(3), 315-328. Brennan, E. (2010). Definitions for social sustainability and social work paper. White paper distributed for CSWE conference, Portland State University. Coates, J. (2003). Ecology and social work toward a new paradigm. Black Point, Nova Scotia: Fernwood Publishing. Cowley, A. S., & Derezotes, D. (1994). Transpersonal psychology and social work education. Journal of Social Work Education, 30(1), 32-41. Gitterman, A., & Germain, C. B. (2008). The life model of social work practice. 3rd ed. (pp. 72) New York: Columbia University Press. Mary, N. L. (2008). Social work in a sustainable world. Chicago: Lyceum. McKinnon, J. (2008). Exploring the nexus between social work and the environment. Australian Social Work, 61(3), 256-268. Zapf, M. K. (2009). Social work and the environment: Understanding people and place. Ontario: Canadian Scholars’ Press.